1 - Easily Accessible from the U.S.A, Canada, UK and Mainland Europe. 2 - Fantastic Sailing Conditions year round, Protected Bays and Stunning Anchorages. 3 - The Finest Selection of All Inclusive Luxury Crewed Catamarans in the World. 4 - The most qualified, experienced and service orientated Crew in the Caribbean. 5 - Deserted Beaches, Amazing Dive Sites, Safe Snorkelling and Iconic Landmarks. The BVI is synonymous with island-hopping and incredible scenery. Each island has something different to offer; whether you are an active crew who want to hike, swim and dive, or simply kick back and relax, soaking up the Island vibes, your broker will help you make the most of your time in the British Virgin Islands! On the largest island of the BVI, Tortola’s Road Town is where you’ll start your crewed catamaran charter. There’s some unforgettable scenery on offer with Mount Sage providing a superb hike, so pack your running shoes! From the top, you’ll be able to see all the places you’ll be desperate to visit onboard your yacht, from the paradise of Smuggler’s Cove to the patches of the Caribbean Sea perfectly suited to kite- boarding, snorkelling and scuba diving. 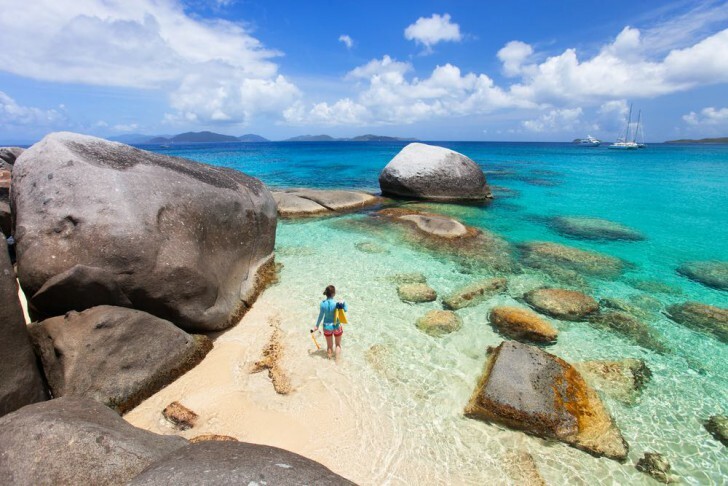 The island of Virgin Gorda combines natural beauty with manmade brilliance. The Baths, a unique sight, consist of a full mile of scattered boulders. With some enchanting paths and rock formations, the national park of The Baths are also home to some desirable snorkelling spots. The waterfront of The Bitter End Yacht Club is packed with restaurants, water sport opportunities and excursions - it has truly been custom built as a utopian yacht destination.. The smallest of the four main islands of the BVI, Jost Van Dyke punches well above its weight with plenty of attractions. The island is home to some of the best bars in the BVI. The Soggy Dollar Bar boasts the famous “Original Painkiller” rum cocktail, alongside some great bites for breakfast, lunch and dinner. Each evening, Foxys provides a great place to let loose and dance the night away, Caribbean style! You’ll revel in starlit relaxation here after a day exploring Majohnny Hill, the highest point of Jost Van Dyke which provides some incredible views. Travelling to Anegada is a journey of the senses. With beautiful pink flamingos dotted on the shore, there’s endless photo opportunities. Alternatively, spot some dolphins from the pure white beaches while you listen to the gentle waves and feel the cool breeze. To top it all off, the island is home to some of the finest lobster in the world! So fine, in fact, it has earned its own festival as local restaurants all serve up what they believe, and we agree, is the best of the best.